Summer came like a lion here in Fort Worth. Even before June 21st, we had over a week of 100+ degree days. I'm trying to keep my garden alive, but it's too hot for me out there during the day. My flowers and vegetables are just frying in the sun and heat. But I did spot this gorgeous dragonfly visiting my garden two afternoons in a row. He was the most amazing shade of orange and didn't seem to mind me taking his photo. While reviewing the packing list for Shea's summer camp, we discovered it said "1 quilt or sleeping bag". Now what is it about me that makes something like, "I should make you a quilt for camp!" leap out of my mouth before my brain has time to realize what I'm saying. And once those words are out there, you can't take them back. I suggested a rag quilt, you know, fast and easy. 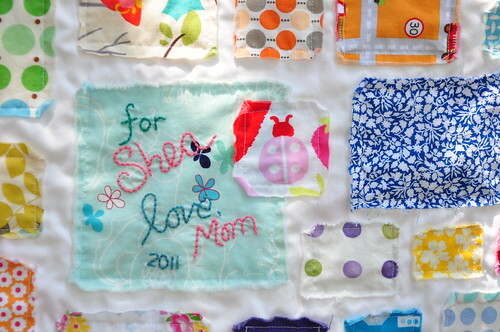 She loved that idea until she realized what a rag quilt looked like. She proceeded to show me her version of a "rag quilt", which was little pieces of fabric sewn to another piece of fabric and all raggy on the edges. Basically, a ticker tape. This thing is such a mess, I can't even believe I'm showing it to you, so don't look too closely. Hopefully, it's twin sized. I didn't even measure it, but I used twin sheets for the body of the quilt, a soft one on the back, a flannel in the middle and a boring white one of the front. Making a twin sized ticket tape is TORTURE. I tried every way I could think of to sew these squares on and finally decided that glueing on multiple pieces and sewing all the horizontals then going back for the verticals was the fastest way. It's not finished, but I am out of time. She leaves tomorrow. I didn't prewash the fabrics I used for the binding, so the binding shrunk quite a bit and I think it's going to make it a challenge to finish. But, I'll deal with that at some point in the future. For now, I'm considering this baby finished; it's folded and packed. I've been keeping busy teaching sewing classes and doing some summer sewing for me. The dress above is a Lisette pattern. Highly recommended. This is a top I draped as an attempt to knock off this cute Anthropologie blouse. Ignore the fabric; it didn't turn out like I wanted it to. 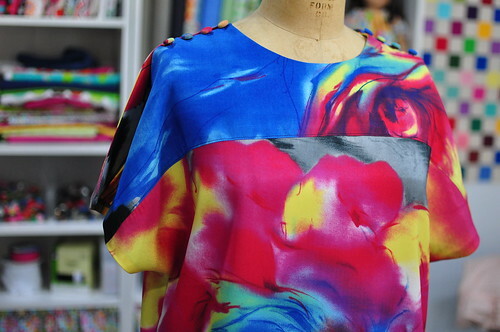 If anyone has a suggestion for an affordable online source for fashion fabric, I would love find some new sources. Joann's fashion fabric stinks. 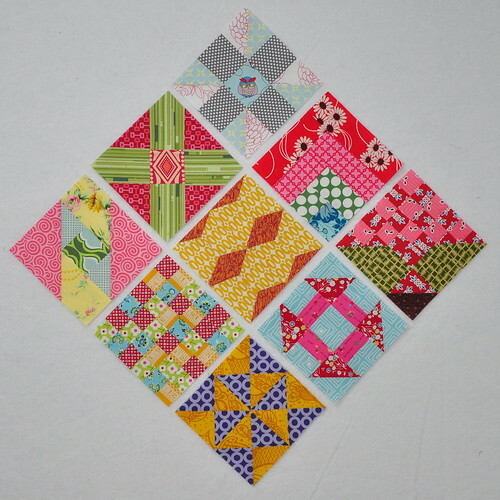 And lastly, my first nine blocks from The Farmer's Wife Sampler Quilt book. I've been looking for a traditional sampler to do in current fabrics, but every time I looked at quilt block encyclopedias, they were full of baskets and houses and other folksy stuff that's a little traditional for my taste. I was considering a Civil War repro sampler quilt when I saw this Farmer's Wife Quilt-a-Long on flickr. These little blocks are so addictive! The quilt along schedule is two blocks a week for a year. I'm sure it will take me a year to finish the quilt, but I think I'm just going to make blocks when I feel moved to do so. I did these in two days. I'll post more about them when I have more time. Right now, I'm off to my birthday party. It's not until next week, but Shea is going to miss it since she'll be away at camp, so we are having a party early. And then tomorrow, it's off to the Ozarks to drop my baby off for two whole weeks! It's a little bittersweet; I know I'm going to miss her madly, but I get two whole weeks off! Two weeks! We've never been apart for two weeks, but I've decided that the Lord must make pre-teens act the way they do as a way to help mothers begin to let go. It makes so much sense. At the rate she's going, by the time she's 18, I will be ready for her leave this nest. 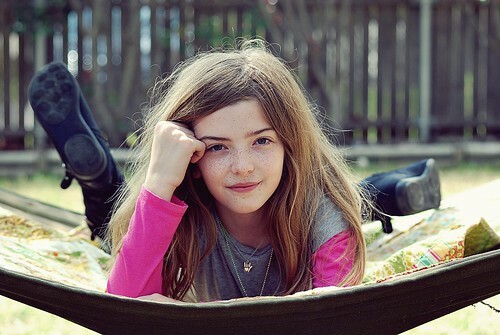 If she remained the precious little sweetheart she was at six or seven, I'd never want to let her go. She's going to have a blast at camp. And I'm going to have a blast at home! Can somebody saw sew-a-thon! 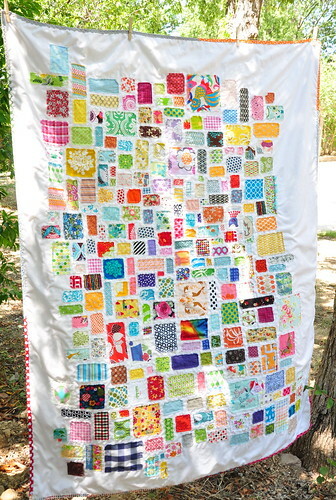 I really like that quilt! I love the colors and I think it will serve its purpose perfectly. I really like the quilt! I think it's really fun!!! 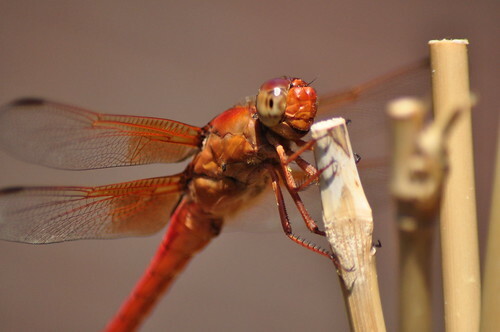 We had those orange dragonflies here yesterday (at least that's when I saw them) and we are south of San Antonio. I've never seen orange ones before! They were gorgeous! I love the blouse you made better than the one on the Anthropoligie website. Yours is much more colorful. I really like that! The Farmer's Wife Sampler quilt is coming along nicely too. Totally agree with the preteen theory you've got going on! Going through it too...oh joy! I personally love love that quilt. So fun! You should check out fashion fabrics club. It's a little daunting but there are great deals and I've been happy with the cotton lawn I purchased there. I just love the ticker tape quilt. And Shea is such a pretty girl. Hope she has a great time at camp and you have a great time at home sewing! Your ticker tape is fun and I am sure it will be well loved. Your farmer's wife blocks are great too. I too agree with the preteen theory! I felt the same way when I was going through it but now my daughters are in their early 20's and I enjoy having them around (again). I think your ticker tape quilt came out so nicely! It was meant to be =). It's nice to hear from you, Melanie. As it happens, my littles are also gone for 2 weeks. It's amazing how quiet the house can be. Enjoy! I actually like the ticker tape quilt as-is. The white border looks cool and offsets some of the busy-ness in the middle. What a lucky daughter! Have you checked out fabric.com? I've been just recently introduced to it and the prices look GREAT!